WhatsApp is finally rolling out the two-step verification for all its users on Android, iOS and Windows Phone. Here's How to Enable two-step verification on WhatsApp The move comes from WhatsApps as it aims to strengthen the security of its over 1.2 billion users. Two-step verification is an optional feature that adds more security to your account. When you have the feature enabled, any attempt to verify your phone number on WhatsApp must be accompanied by the six-digit passcode that you choose. You can enable two-step verification by opening WhatsApp >Settings > Account > Two-step verification > Enable.> On the next screen, enter six-digit passcode >Next, re-enter six-digit passcode.>Optionally, add your email address on the next screen. WhatsApp asks for an email address to link with your account. This email address will let WhatsApp to send a link via email to disable two-step verification in case user forgets the six-digit passcode. Remember that in case you user forget the six-digit passcode, WhatsApp won't permit re-verifying the account within seven days of last using WhatsApp. "After these seven days, your number will be permitted to re-verify on WhatsApp without your passcode, but you will lose all pending messages upon re-verifying - they will be deleted. 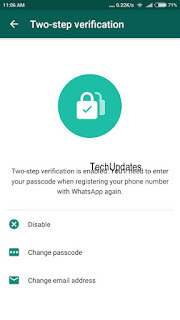 If your number is re-verified on WhatsApp after 30 days of last using WhatsApp, and without your passcode, your account will be deleted and a new one will be created upon successfully re-verifying,"